After months of no news fans have been speculating who the next Rider to join the S.H. 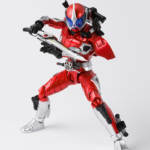 Figuarts Shinkocchou Seihou line will be, and now the June 2017 Tamashii Nations pickup has confirmed that honour will go to Kamen Rider Accel! The no-nonsense police superintendent from Kamen Rider W will be a mass release for June, with pricing details and full accessory count to follow. Not mentioned in the pickup but also joining Accel that month is S.H. Figuarts King Joe from Ultraseven! 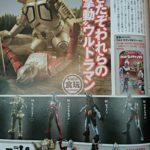 The robot creation of the Alien Pedan is featured on Tamashii Nations’ special Ultraman page, and will be priced 7560 yen. Check out the full image gallery after the jump!